Stopping overeating can be tough. But it's critical to maintain a healthy meal at home if you want to have control calories and reduce fat. This will help you to lose weight fast and have a healthy weight. Humans have an instinctive fear of starvation, and overeating is something that many people tend to do on a daily basis. People often overeat when they are stressed, when they are anxious, or merely because they eat very fast and this doesn't give their digestive system time to send signals to the brain that is full. The appetite is the desire that each person has when eating food and is regulated by the hunger center. This center is stimulated, and the sensation of taste appears. 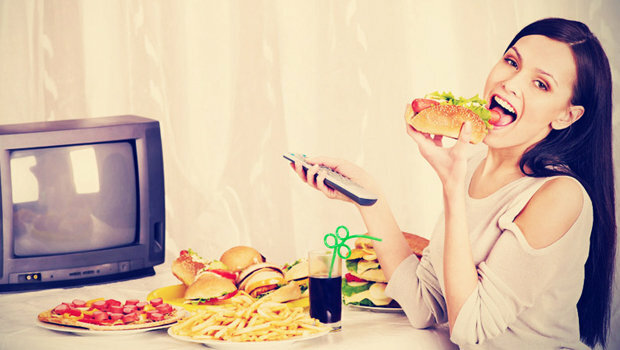 The stimulus reaches the center of satiety and desire for appetite stops. If you are a person who doesn't stop overeating, then we are going to give you some tips so that you can reverse this situation and you can stop overeating. Before you can control hunger, it is important that you can learn to recognize the physical signals that indicate a real need for food. Before eating it is important that you use a hunger scale that will help you determine your real food needs. The death of desire: when you have an empty feeling uncomfortable and may be accompanied by numbness or nervousness caused by low blood sugar due to lack of food. Hungry: when your next meal is on your mind. If you don't eat within an hour, you enter dangerous territory. Moderately Hungry: When your stomach may be growling, and you are planning how you will end that feeling of hunger. This is the best time to eat. Satisfied: when you're satiated, but you're not full, and you're not hungry either. You are relaxed and comfortable, and you can wait for the next meal. Full: when your belly feels slightly swollen, and the food doesn't taste as good as it did in the first few bites. Filling: When you feel uncomfortable and could even have mild stomach stinging from the stomach acids crawling back into your esophagus. If you still can not tell what real hunger you feel, it's a good idea to set your watch and eat every four hours. Moderate or complete hunger is more likely to arrive 4 to 5 hours after a balanced meal. Waiting too long to can send your brain an emergency signal to get energy and the will to make healthy choices falls. Eating regularly keeps your blood sugar and energy stable, which prevents you from feeling an extreme need to consume any unhealthy food. It's essential to eat breakfast every day. It is a good idea to prepare breakfast before bedtime by cutting a fruit and handing out some yogurt. The breakfast habit will help you improve what you eat during the day. A good breakfast will give us the energy to start the day and to follow it with energy as well. You can choose oats with red berries, Greek yogurt, waffles with fruit and butter, or milk and fruit smoothie. Solid foods that are high in the liquid can help suppress hunger. When we eat foods with high water content like fruits and vegetables, we get larger portions for fewer calories. It's a good idea to start eating a salad, you should choose fresh fruit, and vegetables.